Despite only lasting a paltry 14 issues in its original run, Green Lantern/Green Arrow changed American comic books forever. Written by Dennis O’Neil with art by Neal Adams in 1970, the series paired Justice League allies Hal Jordan and Oliver Queen on a mission far greater than thwarting any bank robbery. The two heroes – one a career military man turned intergalactic space cop, the other a bankrupted billionaire turned modern-day Robin Hood – set off in a beat-up truck on a soul-searching journey to heal the broken heart of America. The series introduced realistic problems into the world of superheroes. It also grounded the high-flying Hal Jordan and forced him to examine his role as a hero in a new light while simultaneously forcing the idealistic Oliver Queen to realize he couldn’t see the forest for the trees. Green Lantern’s power ring allowed him to do anything his will allowed, but what good was it when it came to feeding the hungry? What use is a system of laws when evil can twist those laws into a shield and what is legal is more of a concern than what is right? What difference could one good man with a noble spirit truly make when faced with uncountable cold hearts with unlimited resources? These questions still remain with us nearly fifty years later and they lie at the heart of Green Arrow #30. 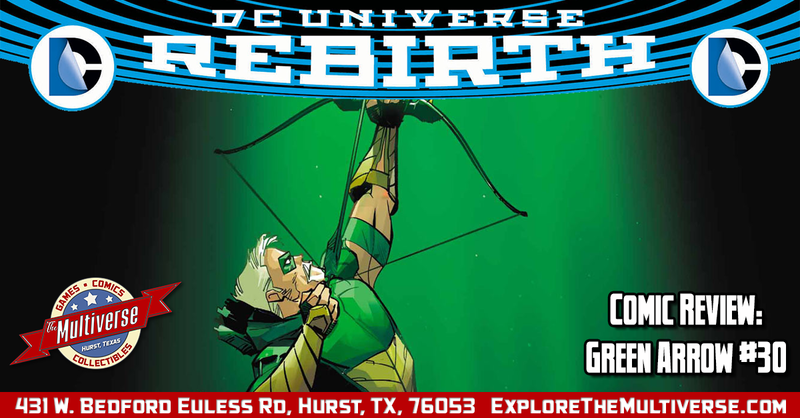 This is the first book since the start of DC Rebirth to team Hal Jordan and Oliver Queen together. It is also the first comic in several years to capture the classic friendship between two heroes that were once best friends and brothers in arms despite their political differences, as well as the mystique of the classic O’Neil and Adams books. Artist and colorist Otto Schmidt’s style is almost a complete 180 from that of Neal Adams. Schmidt’s pencils are rougher and sketchier. His colors are darker and moodier. 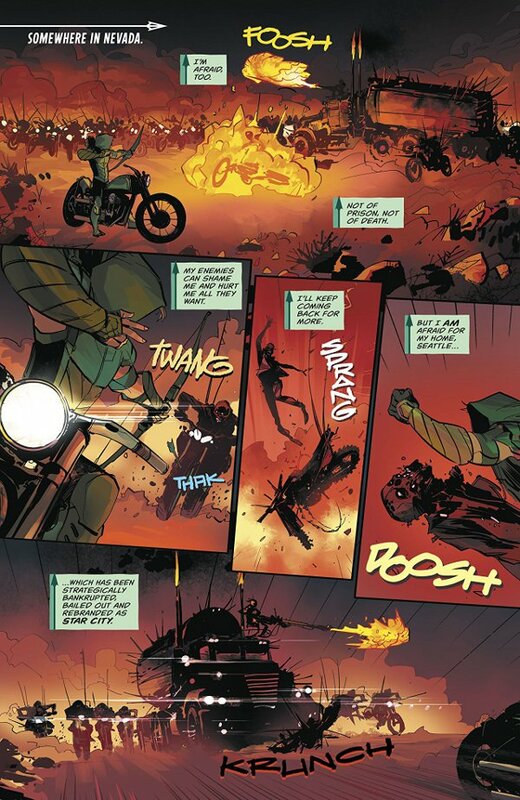 Yet both artists share a sense of complexity and dynamic action that seem perfectly suited to the adventures of Green Arrow. Benjamin Percy’s script taps into the spirit of the classic O’Neil stories almost immediately with a timely montage that speaks to the current zeitgeist of America. 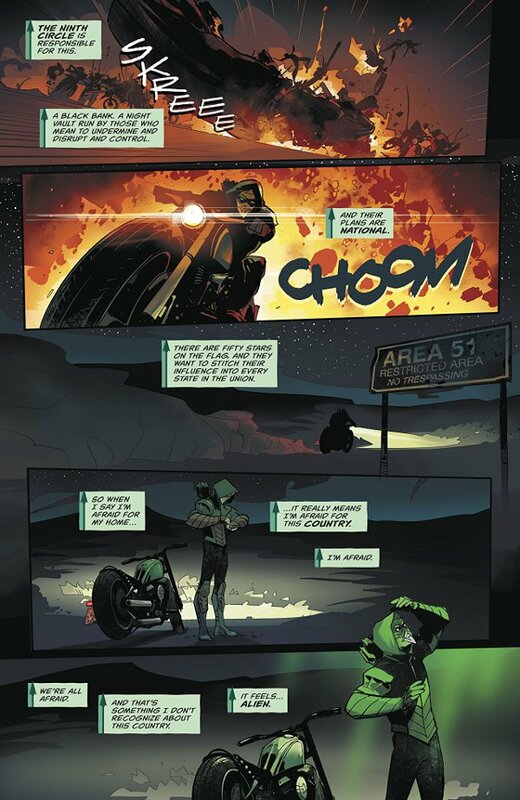 This sequence also doubles as an effective piece of exposition, smoothly detailing the story so far in Green Arrow since the start of Rebirth. 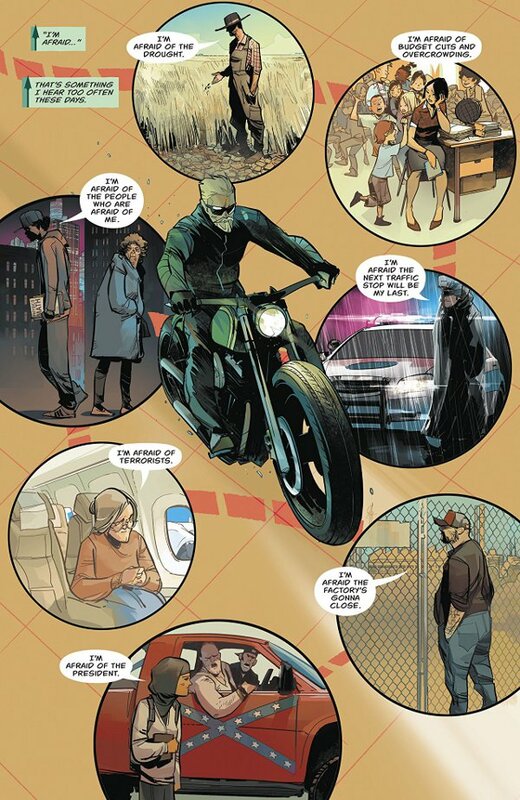 Despite this issue being Part Five of the Hard-Traveling Hero storyline, a new reader could easily jump in on this issue and feel like they were missing nothing.